A customer recently contacted me with an interesting question. They were using a SharePoint task list to help schedule jobs for field engineers but rather than have a Start Date and End Date field they wanted to have a Start Date and Duration field and automatically work out the End Date. 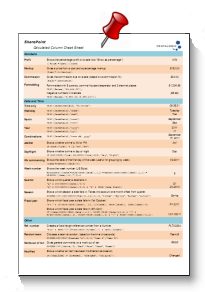 They were then planning to display this using Planner in the By Category view which is idea for resource booking as it makes it easy to see when a resource is booked or free (SharePoints built in gantt chart can’t do this swimlane style of view and doesn’t support using calculated columns). Now this is easy to do if the Duration is specified in days – in fact you just use the equation above – but what if Duration is in hours or minutes? First port of call is this page from Microsoft showing examples of common date time formula you can use in SharePoint calculated columns hmmm, adding days OK… adding months Check… adding years OK too….but nothing about hours. Back to the drawing board. 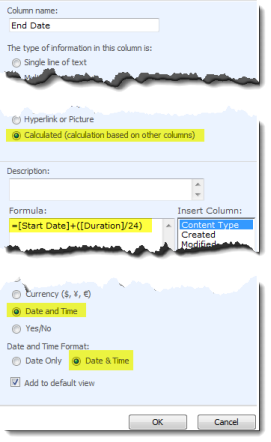 Then we add that number to the Start Date and finally as our calculated column is defined as a date/time field SharePoint is turning the number (e.g. 40,296.50) back into a readable date/time value. This will work with Durations greater than 24 or even 1/2 hours etc. If you want to specify Duration in minutes then instead of /24 above you would use /1440 (the number of minutes in a day). You can use this for anything that has a duration – tasks, service jobs, meetings, flights, equipment booking etc. a handy 3 page reference for calculated column functions and formulas. Thanks Ryan. Can never have enough calculated formulas we can just copy and paste, keep ’em coming. We were using your above examples (see specific code below) and everthing was working great. We have come back to a new year, 2011 and all of a sudden we are getting ?NAME error in the end: field (field which added 30 mins on). The year change may be a ‘red herring’, is there a system setting/change which could affect this solution? Incidentally the same calculation still works ok in Excel? Very-very-very good tip!!! thank you! Bonus question: now that you have a calculated column that is date/time – can you create a “Calendar” view using it? in SharePoint date and time how to increase the minute 1,2,3 like that bcas .The default Datetimecontrol of SharePoint is increment of 5 min. how can decrease or increase?